The commercial curb system is an economical solution for providing daylight through roofs of industrial applications. Because the curb and skylight are pre-fabricated and pre-glazed, installation time is very quick, and the cost of installing our commercial curb system is an affordable solution - usually costing less than $35 per square foot of daylight. The highly versatile commercial curb system can be adapted to fit nearly any size space. The system can be painted, lined or insulated based on the needs of the building. Flat, single, or double slope applications are available. Our framed-in roof monitor provides a customized standard approach to providing daylight to commercial spaces. 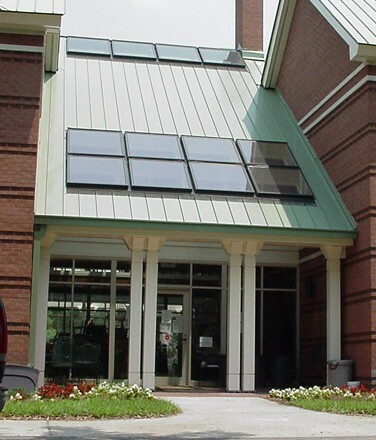 It allows standard VELUX deck mounted skylights to be grouped in a custom configuration that meets the architectural needs of the building – resulting in a structural glazing look at standard skylight pricing. Because the skylights are individually framed into the actual building, there are no size limitations for framed-in roof monitors. Skylights can be placed as close as 2½" apart, frame to frame. When properly flashed in with a VELUX flashing system, you can be assured a leak-proof installation. A complete line of electrical and manual sunscreening accessories are available with our framed-in systems, including blackout blinds, roller blinds and venetian blinds. 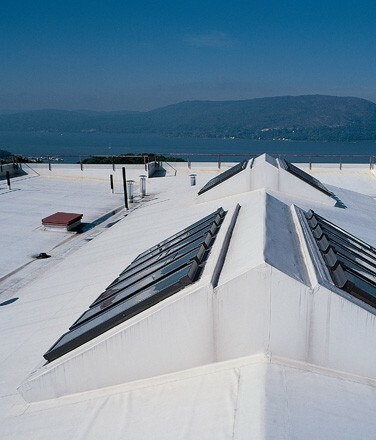 In sloped-roof applications, combi-flashing systems can provide a dramatic effect for light-commercial and multi-family structures. 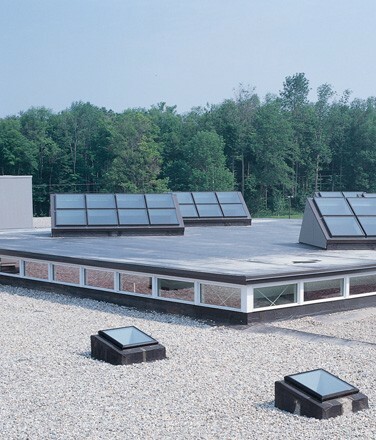 Our combi-flashed systems combine deck-mounted skylights with a pre-engineered combi-flashing. These flashing systems combine multiple skylights together into a single grouped unit and allow an infinite combination of architectural possibilities. From providing abundant natural light and fresh air at the touch of a button to manual controls to fixed skylights, a combi-flashed system can combine different skylight options in one space. A complete line of electrical and manual sunscreening accessories are available with our combi-flashed systems, including blackout blinds, roller blinds and venetian blinds. For added peace of mind, VELUX flashing comes with a 10-year warranty against manufacturer's defect. See VELUX warranty brochure for complete details.